If you are living with gum disease (periodontal disease), you join more than 50% of adult Americans who are also battling the infection. To stop the damaging consequences the disease has on your oral and overall health, you need effective treatment. Unfortunately, this often means having to be referred to another location when needing a periodontist in Colorado Springs. Not with Rocky Mountain Periodontal Specialists. We treat all patients with periodontal disease right in our office so you no longer need to be referred to another location. The symptoms of gum disease can take many forms. They can be as simple as swollen gums to more severe, such as exposed roots and loose teeth. No matter the severity of the issues you face from the infection, we offer the treatment and maintenance you need. Treatment often begins with a process known as root scaling and planing. This is a deep cleaning procedure that cleans the deep pockets of the gum tissue to remove tartar and plaque that has accumulated. The roots of the teeth are then smoothed to prevent the reoccurrence of the infection. 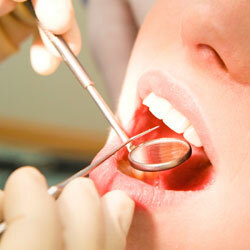 As specialists in gum disease, we perform more than just the basics from our office. We even offer the most complex procedures, so all your periodontal needs are met from one location. If the infection has been left untreated, deep pockets can form in the gum tissue, creating the perfect environment for bacteria to breed. Through a surgical treatment known as “pocket reduction,” the size of the pockets is reduced while the harmful bacteria is removed. This stops further damage to the bone while allowing the gum tissue to reattach. When the bone and gum tissue has been destroyed from the infection, you may need a regeneration procedure. This can involve using membranes, bone grafts, or tissue stimulating proteins to help your body regenerate new bone and tissue. For those who have excessive gum tissue that makes the teeth appear shorter, we can lengthen the appearance of your teeth using a simple procedure. With crown lengthening, we will give your gum tissue a more attractive appearance for a more proportionate smile. Gum disease can cause the roots of the teeth to become exposed due to gum recession. When this occurs, you need a gum graft to cover the exposed root. Using tissue from your palate or a donor tissue, the tooth root will be covered to even out your gum line. Unfortunately, untreated gum disease can lead to the eventual loss of your teeth. If your infection has progressed to the point you need a tooth extracted, we offer the procedure you need to remove the tooth while also providing tooth replacement options with dental implants. If you need a Colorado Springs periodontist, benefit from the one-stop location for periodontal therapy. With Rocky Mountain Periodontal Specialists, you will receive the care you need from one office. Contact our office today to schedule a consultation.